Freddy Kenton was born to a circus family where, at 16 years of age he joined with his parent’s famous aerial act “The Kentons”. Dutch by birth, they traveled America with Ringling Brothers and Freddy learned many circus skills, including aerial, tumbling, acrobatics and … entertainment! 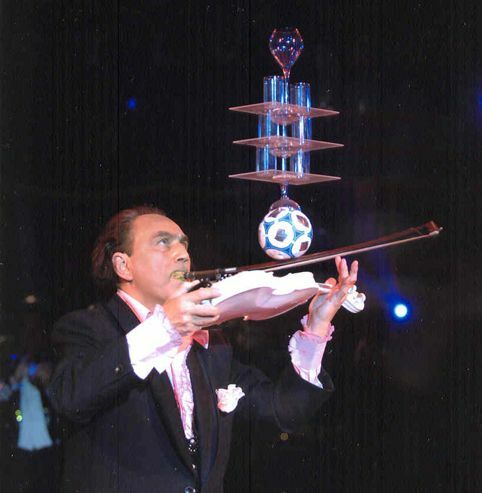 But juggling was and is his love and as a juggler he has worked the great theaters of Europe including the Moulin Rouge, Blackpool Tower and shows too numerous to mention. Freddy will be assisted in his performance by his wife Evelyne, a performer born and raised in the legendary Bouglione circus family. Evelyne is noted for her work with her sisters in Ringling as the Dors Sister Rolling Globes. We are so pleased to have Seattle’s Moisture Festival join the list of venues blessed with their presence. Welcome back Freddy and Evelyne!